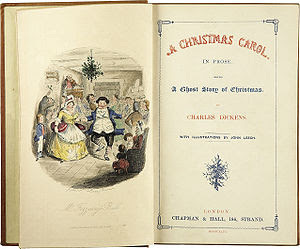 On Dec. 19, 1843, Charles Dickens first published one of the most widely known holiday stories, A Christmas Carol. I dug around a bit to find the origins of this tale, and although widely diverging versions exist, one of the most reliable seems to be from PBS’s A Writer’s Almanac. According to them, Dickens was inspired to write A Christmas Carol after reading a disturbing news story about child labor in England. He went to Cornwall to see for himself the horrible conditions of child workers in the mines there. He then visited the free schools set up for poor children. Seeing the terrible situation of children in poverty made him so angry, he decided to write a book exposing it, and publish it at his own expense. The original title was A Christmas Carol in Prose. Shown is a first edition. The plot is as familiar as Christmas cookies. Ebenezer Scrooge, a mean old miser, goes through a life transformation during Christmas, a holiday he scorned: "Every idiot who goes about with Merry Christmas on his lips should be boiled with his own pudding and buried with a stake of holly through his heart." But after three visits from spirits, he sheds his hardened exterior and throws open his arms to embrace others at the end: "I am as light as a feather, I am as happy as an angel, I am as merry as a school-boy. I am as giddy as a drunken man. A merry Christmas to everybody!" Timing was ripe for Dickens to publish A Christmas Carol. In the 17th century, the Puritans declared the holiday illegal, citing the fact that the Bible never gave the date of Christ’s birth. Thus, they deemed it a pagan celebration. But Christmas enjoyed a resurgence in England in 1840, when Queen Victoria married a German prince, Albert. German traditions like Christmas trees became popular again in England. A Christmas Carol showed Christmas as a time for family and for sharing simple pleasures. Some still viewed celebrates such as parties, dancing and drinking and playing games, dangerously close to Pagan rituals. But Dickens' vision of Christmas still inspires many to keep the Christmas spirit alive. One of my favorite versions stars Patrick Stewart. Last Christmas, I bought the Disney DVD with Jim Carrey, which seems a nice halfway version between The Muppets Christmas Carol and the stern old black and white version. Of all the remakes, which is your favorite? It seems ever year for the past four, I've had a new book come out right before or right after Christmas. It does make the holidays a little hectic with trying to promote and still be the mover and organizer of all family celebrations of the season. But it's fun. I'm pleased to announce the release of the third book in my Tigers of Salubria fantasy romance series, A Tiger's Courage. My publishers, New Concepts Publishing, one of the first and most successful ebook publishers, has really outdone themselves with the book cover on this book. ATC is a romance, of course, but they did such a great job inserting the desert setting into the cover art, it really sets the tone for the book. And the font they used for the title and my name is very unusual and cool. So in between getting out some last minute Christmas cards (okay, all of them) shopping for the last few things, (some of them as yet unknown), planning for the big family gathering(no cookies baked yet) and scrambling to catch up with the day job, I'll be promoting A Tiger's Courage here and there over the holiday season. So what do you think of the book cover? Do you have a favorite setting for a novel? I remember the days when I spent my afternoons in the library, searching through books, selecting a pile to take home, and the looks from the librarian who thought I would never finish them all in two weeks. Many of those libraries are closed now, and the book stores sprung up in the neighborhoods. But within a few short decades, they saw their demise. The closing of major book stores leaves a gap in my soul. What is to become of the book? The time I've spent browsing, sniffing pages and reading back covers in book stores could be culminated into years. (not to mention gaping at the front covers) For some avid readers and writers, there is no better time, and it is something that could only be understood by others who pursue the same past time. Buying a book is easier now. It is only one-click away on Amazon. There is no reason to leave home, or to get off that seat anymore. And I have to admit being able to read in a dark room with a glowing Kindle on my lap has its appeal. I never go anywhere without it. The bag I carry to my child's soccer game, my purse, my brief case--they must all be large enough to carry the Kindle. 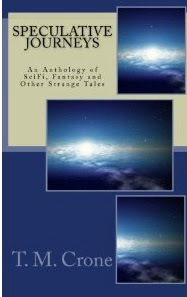 SPECULATIVE JOURNEYS: An Anthology of Scifi, Fantasy and other Strange Tales, is an anthology of my previously published short stories that can be found on Amazon.com. It is now available in Kindle format for those who don't want to leave their seat in order to buy a book. The book is not dying, it never will. But the major publishers have initiated their own downfall, and until they open their eyes and crawl out of their holes, the book will continue to transform. SPECULATIVE JOURNEYS is now available in Kindle format at Amazon.com. Hi Everyone: I'm sorry I've been absent for awhile but holiday travels plus trying to market the manuscript from my latest novel has made for a wild time. Morgan is a multi-published author and has put together a terrific newsletter. 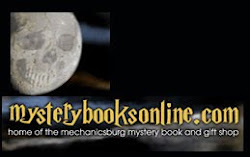 The second segment from my notes from the Donald Maass Workshop I attended at the Greater Lehigh Valley Writers conference is in there as well as a wealth of other material to help aspiring and published authors.